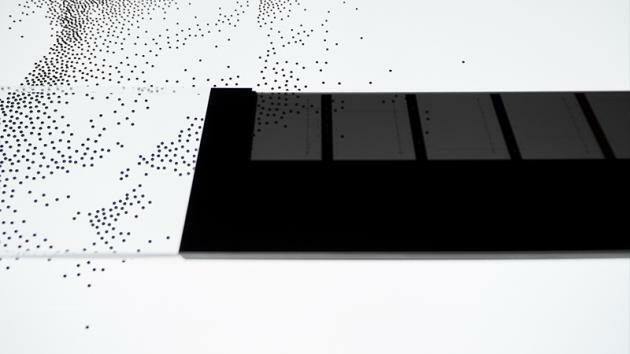 "Supersymmetry attempts to transform the complexity of quantum information theory into an immersive aesthetic experience, meshing sound, visual data and high-speed light displays. The show pairs two inter-related installations. As you step into the cavernous, pitch-black space at the top of Brewer Street Car Park in Soho, you're confronted by [experiment]. 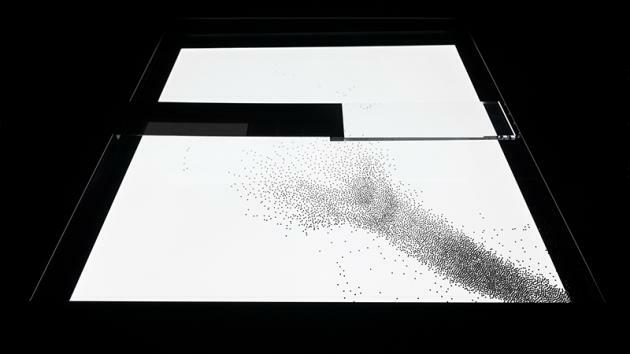 Three 1m x 1m light boxes, glowing white, skitter and whoosh with tiny ball bearings, forming unique and unpredictable patterns. It's a disorientating experience, leaving you feeling adrift in such a frenetic space, with red lasers constantly scanning the surface movements. As you step through the curtain into the next space, [experience], you're plunged into the middle of two 20m-long screens, blinking with forty monitors, all displaying how the previous room's data has been analysed and translated. The synchronized monitors pulse with high-speed analyses and typed text, while the electronic soundscape -- a symphony of bleeps, buzzes and droning hums -- adds to the charged atmosphere. The overall effect, as you glance at the mutating text and the rapid-fire bombardment of data, is both hypnotic and hallucinatory, and yet there's also something strangely oppressive about being caught in this endless loop of sound and information." 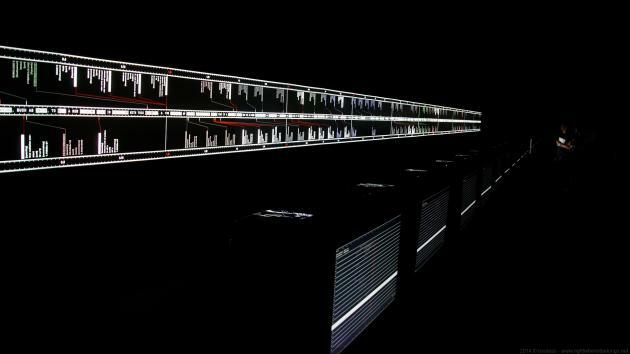 "Supersymmetry" by Ryoji Ikeda, 2015. The exhibition runs at The Vinyl Factory Space at Brewer Street Car Park, London, W1F 0LA, until 31 May 2015. It may be noted that backstage behaviour has what psychologists might call a 'regressive' character. The question, of course, is whether a backstage gives individuals an opportunity to regress or whether regression, in the clinical sense, is backstage conduct invoked on inappropriate occasions for motives that are not socially approved. Goffman, E. (1959). "The Presentation of Self in Everyday Life", University of Edinburgh Social Sciences Research Centre.